Bonjour! Je m’appelle Soleil!! Je suis tres jolie! 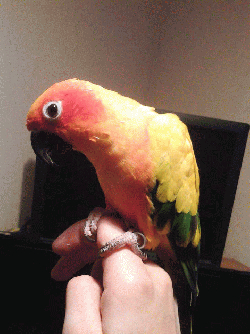 I am a 4-year old female (I’ve laid a couple of eggs which is always a sure sign) Sun Conure. Unfortunately, due to circumstances beyond my mom’s control (she had to move and couldn’t take me with), I am now looking for a new home. I’m very friendly and affectionate. I love to head-bob and dance to music. I can step-up, I love head scritches, and I don’t bite! I like to fly around, but when it’s time for me to go back in my cage I’ll get on your finger and go right back in. Cover me up and it’s time for sweet dreams of Paris and strolling down the Champs-Elysees!! I’m a little bit noisy in the mornings/evenings, but what Sun Conure isn’t? I’m just looking for my flock!! I’m good with kids and both men and women equally. I’m kind of nervous around dogs and cats (sometimes they scare me!!) but if you have furry family members I’m sure I can learn to love them too with enough time. I currently eat Kaytee Forti-Diet Egg-cite for Conures along with apples, grapes, greens, and eggs. I think I need some pellets, don’t you??? And more veggies! If you make a foraging game out of it I promise I’ll play along! Am I practically perfect? Bien sur!! If you agree please contact the Conure coordinator and ask for the French Sun Soleil! !